This series of postage stamps was issued to commemorate the three hundredth anniversary of the settling of Walloons in New Netherlands, now the state of New York, in 1624. The 1¢ has for it's central design a view of the ship New Netherlands, upon which the Walloons sailed. 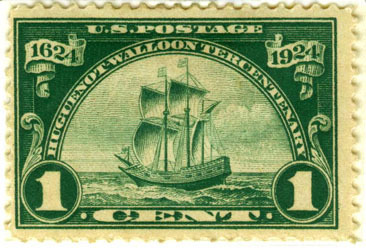 The central design of the 2¢ stamp represents the landing of the Walloons at Albany, New York. 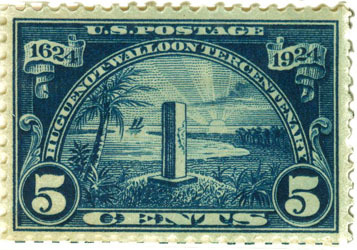 The 5¢ stamp has for it's central design the Ribault Memorial Monument located at Mayport, Florida, showing the landing place of one colony of Walloons. 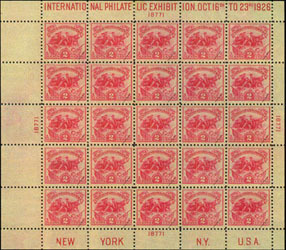 The stamps were first placed on sale May 1st 1924 at Washington D. C. and additional post offices. "The Huguenots were members of the Protestant Reformed Church of France (or French Calvinists) from the sixteenth to the eighteenth centuries. Since the eighteenth century, Huguenots have been commonly designated "French Protestants", the title being suggested by their German co-religionists or "Calvinists". Protestants in France were inspired by the writings of John Calvin in the 1530s and the name Huguenots was already in use by the 1560s. Many Huguenots emigrated from France in the late 17th century. Historians agree that the history of the Walloon movement started in 1880. Prior to the political phenomenon known as the Walloon Movement there were, from 1856 on, literary and folkloric movements based around the Society of Walloon Literature of Liège but it was not until around 1880 that a "Walloon and French-speaking defense movement" appeared, following the first linguistic laws of the 1870s. Thereafter, the movement asserted the existence of Wallonia and a Walloon identity while not giving up the defense of the French language." 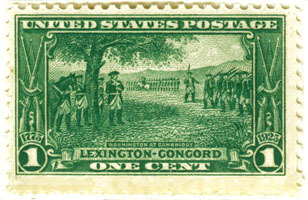 This series of postage stamps was issued to commemorate the One hundredth & Fiftieth anniversary of the Battle of Lexington and Concord. The 1¢ has for it's central design of "Washington at Cambridge" from a photoglyphic chart in possession of the Cambridge Public Library and represents Washington taking command of the American Army. 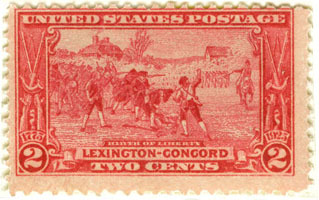 The central design of the 2¢ stamp is "birth of Liberty" from the painting by Henry Sandham in the town hall at Lexington and represents the Battle of Lexington and Concord. 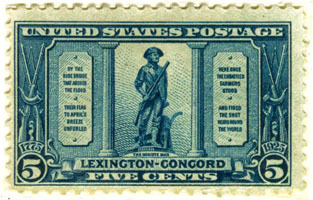 The subject of the 5¢ stamp is the "Minute Man" from a photograph of the statue located at Concord, Mass. The stamps were first placed on sale May 4tht 1925 at Washington D. C. and additional post offices. "The battles of Lexington and Concord were the first military engagements of the American Revolutionary War. They were fought on April 19, 1775, in Middlesex County, Province of Massachusetts Bay, within the towns of Lexington, Concord, Lincoln, Menotomy (present-day Arlington), and Cambridge, near Boston. The battles marked the outbreak of open armed conflict between the Kingdom of Great Britain and its thirteen colonies in the mainland of British North America. More militiamen arrived soon thereafter and inflicted heavy damage on the regulars as they marched back towards Boston. Upon returning to Lexington, Smith's expedition was rescued by reinforcements under Lieutenant-General Hugh Percy. The combined force, now of about 1,700 men, marched back to Boston under heavy fire in a tactical withdrawal and eventually reached the safety of Charlestown. The accumulated militias blockaded the narrow land accesses to Charlestown and Boston, starting the Siege of Boston." These stamps were issued to commemorate the one-hundredth anniversary of the arrival in New York, on October 9th 1825, of the sloop Restaurationen* with the first group of immigrants to the United States from Norway. 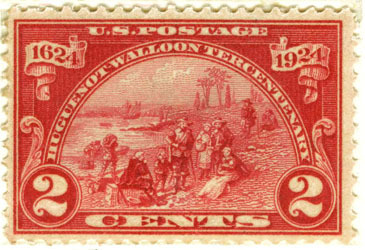 The 2-cent stamp has for it's central design a ship representing the sloop Restaurationen, with a smaller vessel in the background, from a photoengraving. 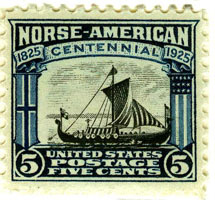 The 5-cent stamp has a Viking ship is from a photograph of the Viking which sailed from Norway to Chicago for the Columbian Exposition of 1893. 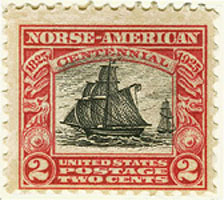 The first issues of the Norse-American stamps were placed on sale May 18th, 1925 in St. Paul, Minn, Benson and Northfield, Minn, Algona and Decorah, Iowa, and Washington D. C.
"Restauration was a sloop built in 1801 in Hardanger, Norway. It became a symbol of Norwegian American immigration. Historical sources may contain several variations on the name of the sloop, including Restauration, Restoration, Restaurasjonen, and Restorasjon. On what is considered the first organized emigration from Norway to the United States, Restauration set sail from Stavanger on July 5, 1825, with 52 people aboard, many of them Norwegian Quakers. Probably many of this group belonged to a similar local movement, the Haugeans, a Lutheran sect which derived its name from Hans Nielsen Hauge. The group, led by Cleng Peerson, landed in New York City on October 9, 1825 after a three-month voyage, and moved onward to their first settlement, in Kendall, Orleans County, New York. The people who made this voyage are sometimes referred to as the Sloopers." The stamp has for it's central design the Liberty Bell. 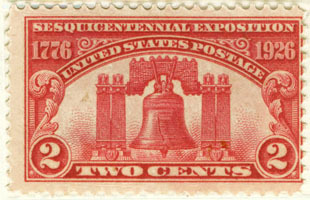 The stamp was first placed on sale May 10th, 1926, at the Post Offices at Philadelphia, Pa, Boston, Mass, and Washington D. C.
The senior draftsman for the design of the exposition buildings was a young Louis Kahn, later a world-renowned architect, then working under City Architect John Molitor. The fair opened on May 31st, 1926, and ran through November on grounds bounded by 10th Street, Packer Avenue, 23rd Street, and the U.S. Navy Yard (Terminal Avenue) in South Philadelphia. Originally known as League Island Park, these grounds are now occupied by FDR Park, Marconi Plaza, Packer Park Residential Neighborhood, the four facilities of Philadelphia's massive South Philadelphia Sports Complex (Wachovia Spectrum. Wachovia Center, Lincoln Financial Field, and Citizens Bank Park), and the Philadelphia Eagles training complex which now occupy that portion of the grounds which from 1933 to 1993 were the site of Philadelphia Naval Hospital (demolished 2001). Organizers constructed an 80 foot replica of the Exposition's symbol, the Liberty Bell, covered in 26,000 light bulbs, at the gateway to the festival. Sesqui-Centennial Stadium (later known as Philadelphia Municipal Stadium, and after 1964, John F. Kennedy Stadium) was built in conjunction with the fair. Also on display at the exposition was the Curtis Organ, still one of the largest pipe organs in the world. In 1926 the first bridge (later renamed Benjamin Franklin Bridge) spanning the Delaware River between center city Philadelphia and Camden, New Jersey, was built in anticipation of the attending crowds. The fair drew a much smaller crowd than anticipated (about 10 million people). It ended up unable to cover its debts and was placed into receivership in 1927, at which point its assets were sold at auction." A new stamp of 5-cent denomination was issued as a memorial to John Ericsson, builder of the Monitor, and in connection with the unveiling of his statue by the Crown Prince of Sweden at Washington D. C. on May 29th, 1926. 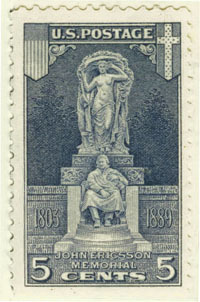 The subject for this stamp is a model similar to the John Ericsson memorial statue designed by J. E. Frazer. The 5-cent stamp was first placed on sale May 29th, 1926 at New York, N. Y., Chicago, Ill, Minneapolis, Minn, and Washington D. C.
"John Ericsson was (born July 31, 1803, Långbanshyttan, Swed. — died March 8, 1889, New York, N.Y., U.S.) Swedish-U.S. naval engineer and inventor. He moved to England in 1826, where he constructed a steam locomotive (1829) and later devised a caloric engine and patented a screw propeller. He immigrated to the U.S in 1839. During the Civil War he proposed, designed, and built a novel warship, the Monitor. Its battle with the Confederacy's Merrimack led the government to place an order for many more such vessels. Wholly steam-powered and with a screw propeller and an armoured revolving turret, it set a new pattern for U.S. warships that continued until the 20th century. He later developed a torpedo and investigated solar-powered motors." This stamp of 2-cent denomination was issued to commemorate the one hundredth and fiftieth anniversary of the Battle of White Plains. 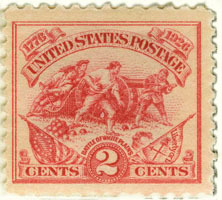 The stamp illustrates a gun crew dressed in Continental uniforms. In the left hand corner is the Continental Flag. In the right corner is the historic "Liberty or Death" flag, first used in the Battle of White Plains. This stamp was first issued on sale October 18th, 1926, at the Post Office at White Plains New York and at the Philatelic Agency established at the International Philatelic Exhibition at Grand Central Palace, New York City, from Oct 16th to 23rd inclusive. The Battle of White Plains stamp was also issued in special sheets of 25 each stamps with the inscription "International Philatelic Exhibition" appearing on the margins of each sheet. "White Plains City, New York, seat of Westchester co., settled by Puritans from Connecticut in 1683; Inc. as a village 1866, as a city 1916. The state convention that ratified the Declaration of Independence met (1776) in White Plains. The battle of White Plains (1776), a principal engagement of the American Revolution, followed Gen. George Washington's retreat from New York City. Washington briefly made his headquarters (1738) in White Plains at the Elijah Miller House, which still stands. Other buildings from the Revolutionary period are also preserved."